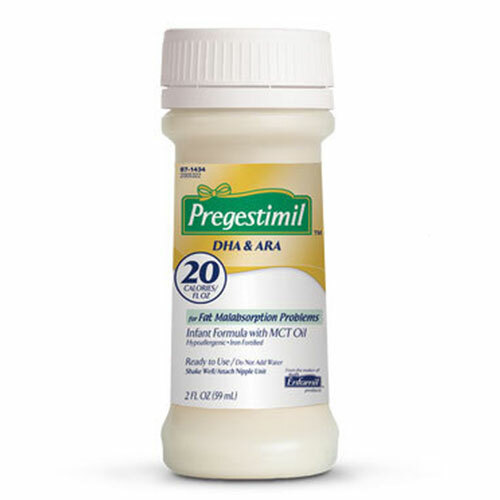 You are buying Enfamil Pregestimil DHA & ARA With Lipil Ready To Use 2oz 48-Pack, Model #4023537. ADW Diabetes offers a complete line of Enfamil baby formula products both in liquid and powder form. We offer these items in both single and discounted bulk quantities for your convenience.At ADW Diabetes, we offer fast shipping, great pricing, and excellent service on all of your baby formula and health care needs. The Enfamil Pregestimil DHA & ARA With Lipil Ready To Use 2oz 48-Pack is specifically designed for infants who have trouble absorbing fat or who may be sensitive to intact proteins. Contains 55% of the fat from MCT oil which is more easily absorbed by babies with some GI problems. Water (87%), Corn Syrup Solids (5%), Casein Hydrolystate* (From Milk) (2%), Medium Chain Triglycerides (MCT Oil) (2%), And Less Than 2%: Modified Corn Starch, Soy Oil, High Oleic Vegetable Oil (Safflower and/or Sunflower Oils), Mortierella Alpina Oil(ARA), Crypthecodinium Cohnii Oil(DHA), Carrageenan, Vitamin A Palmitate, Vitamin D3, Vitamin E Acetate, Vitamin K1, Thiamin Hydrochloride, Riboflavin, Vitamin B6 Hydrochloride, vitamin B12, Niacinamide, Folic Acid, Calcium Pantothenate, biotin, Ascorbic Acid, Chlorine Chloride, Inositol, Calcium Carbonate, Calcium Hydroxide, Calcium Phosphate, Potassium Phosphate, Magnesium Chloride, Ferrous Slfate, Zinc Sulfate, Manganese Sulfate, Cupric Selenate, Potassium Chloride, L-Cystine, L-Tyrosine, L-Tryptophan, Taurine, L-Carnitne. *Motified to be better tolerated in milk-allergic babies.